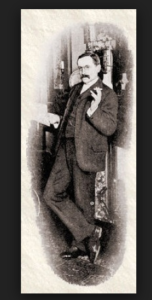 Arthur Morrison was an English novelist known for his realistic and short stories describing the slum life in London’s East End at the end of the Victorian Era. He was born on November 1, 1863, in London and he died on December 4, 1945 at Chalfont St. Peter, Buckinghamshire. Arthur Morrison was a son of an engine fitter. He wanted to sever connections with his working class. He referred to his father as a professional and asserted that he was born in Kent. But his birth certificate showed otherwise. His humble origin influenced him. As he grew up he became a stalwart of talent and succeeded in life, irrespective of his background. Morrison married Elizabeth Thatcher, whom he had met her at the People’s Palace. A son was born to them in 1893 and he was named Guy. Morrison began his writing career in 1889 as a sub-editor of the journal ‘People’s Palace’. It was an institution that was designed to bring culture into the London slums. He wrote articles on sports and other subjects for various periodicals. He became a freelance journalist in 1890 and became a regular contributor to William Ernest s/Henley’s ‘National Observer’ in 1892. In ‘ National Observer’, most of Morrison’s first major work, “Tales of Mean Streets” (1894), originally appeared. This East End trilogy was completed with “A Child Of Jago” (1896) and “To London Town” (1899).” The Hole in the Wall” (1902) was Morrison’s another novel that portrayed slum life in a powerful manner. Morrison began to study occult so as to establish himself as a writer. This resulted in his work, “The Shadows Around Us: Authentic Tales of the Supernatural”. This was published in 1891. He wrote an article describing the respectable monotony of a street in the East End. This arousedthe interest of W.E. Henley, who was the editor of “National Observer”. Henley encouraged Morrison to write more fictional stories, that pointed the state of social exclusion of inhabitants of slums, noticing his observational skills and his power of description. Morrison’s realistic novels and stories have a sober tone. The characters are portrayed with lot of colorfulness. Rather than being radical, his attitude towards people he described was paternalist. He opposed socialism and trade union movement. He wrote detective fiction that featured the lawyer detective Martin Hewitt. It was published in Strand magazine. It was a competitor to Arthur Conan Doyle’s Sherlock Homes. He a collector of Chinese and Japanese Art. He published the Authoritative Painters of Japan in 1911. Morrison retired from journalistic work in 1913. He moved to a home in High Beach in Epping Forest. Guy, his son joined the army in 1914 and served in World War I. Morrison continued to publish works about art. . In 1915 , he served as a special constable in Essex. In 1924 ,he was elected as a member of Royal Society Of Literature . He moved to his last home in Chalfont St. Peter, Buckinghamshire, in 1930. He published short story collection “ Fiddle o’ Dreams and More”, in 1933. Morrison died in 1945, leaving behind his collection of paintings, woodcuts and a collection of ceremonial tea porceline to the British Museum.